For many appreciators the essence of country music is harmony singing. Country harmony, for most of these, is synonymous with the blended voices of Ira and Charles Louvin. They were Elvis's favorite duo, and The Grove Dictionary of American Music says that they are "probably the greatest traditional country duo in history." 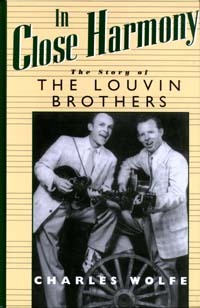 The Louvin Brothers, for sure, have influenced almost all revered rock-and-roll singers and country singers, from the Everly Brothers to Emmylou Harris. They grew up in rural Alabama in the 1930s, inspired by the thriving gospel-music tradition and by brother-duet acts on southern radio. By the late '40s they were rising stars playing their own songs on these stations. By 1955 they had joined the Grand Ole Opry. They enjoyed national renown and toured with Roy Acuff and with Elvis Presley. Until now there has been no full-length book about their remarkable career and their rich, complex music. In Close Harmony provides a detailed portarit of the Louvins and the turbulent country-music world of the 1950s. Although Ira emerged as one of Nashville's most talented songwriters, he was tormented by guilt for not following the call to be a preacher. After only eight years in the national spotlight the brothers split up to follow separate careers. Ira was in the list of stars from the country-music panteon who were killed in tragic accidents. In 1965 he died in a car crash. Charles contined as a successful solo performer and remains a member of the Opry and a highly respected figure on the Nashville scene. Here is the first book about the legacy and legend of two beloved country-music troubadours. Charles Wolfe teaches at Middle Tennessee State University. He is the author of many books about American music and musicians, including biographies of Grandpa Jones, Don Gibson, DeFord Bailey, and the blues singer Leadbelly.